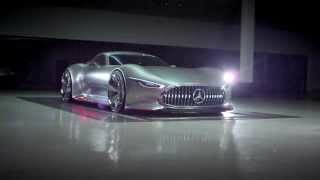 Mercedes-Benz has revealed a visionary concept of a super sports car, the Mercedes-Benz AMG Vision Gran Turismo Concept, created by its in-house design team for inclusion in Sony's new PlayStation 3 game Gran Turismo 6. 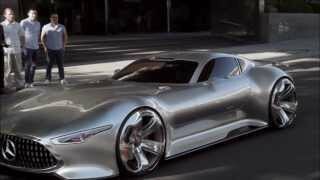 As virtual vehicles that nonetheless function just like a real car, the visionary concepts will be gradually unveiled in and integrated into the new game Gran Turismo 6 through online updates. 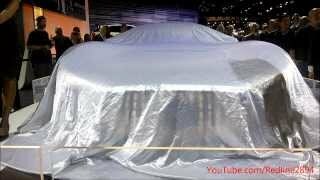 The front-engined vehicle is envisioned with a rear-wheel drive arrangement and gullwing doors. It has an eye-catching feature which is the radiator grille and exclusive LEDs. 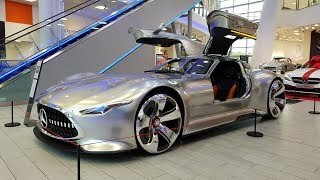 Interior images are not provided but Mercedes-Benz says the Vision Gran Turismo comes with an F1-inspired cockpit with red integral sport seats that blend into the black flooring of the footwell to create a protective shell. 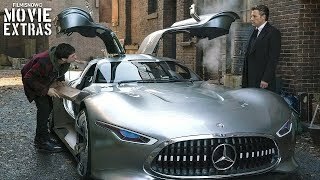 The Mercedes AMG Vision GranTurismo Concept will be powered by the AMG V8 biturbo engine producing 585 hp and 800 Nm of torque. Excellent deceleration values and fade resistance at the highest level are ensured by the AMG ceramic high-performance composite braking system. The AMG sports exhaust system with eight tailpipes integrated into the rear end provides a powerful accompaniment whenever the car accelerates.